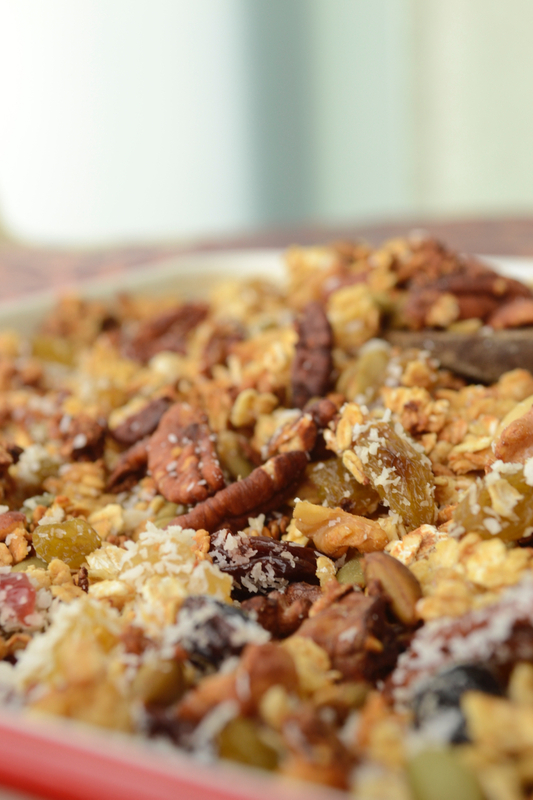 This was one of the very first EVER GastroGays recipes… and it’s taken us about three and a half years to post our homemade granola recipe. 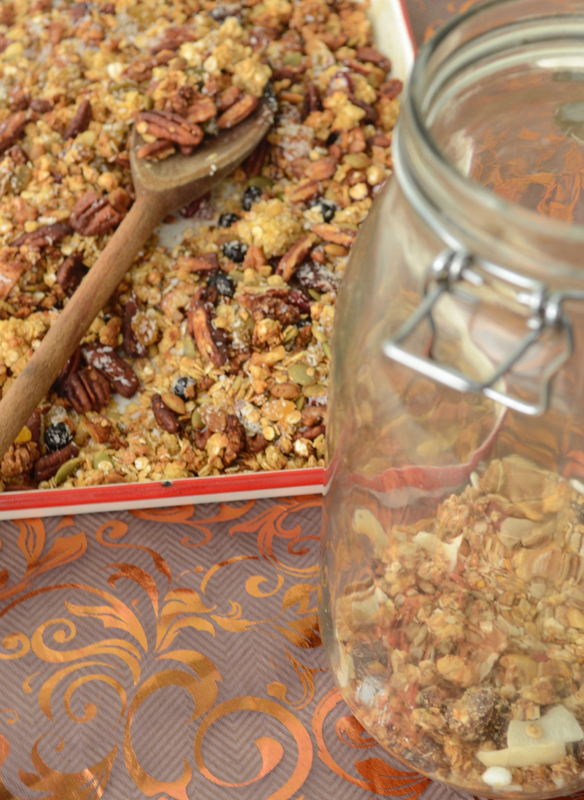 When we were just out of university in Dublin and living together – with really no proper clue how to cook – granola was one of the first recipes we ever made that we adapted and made our own. 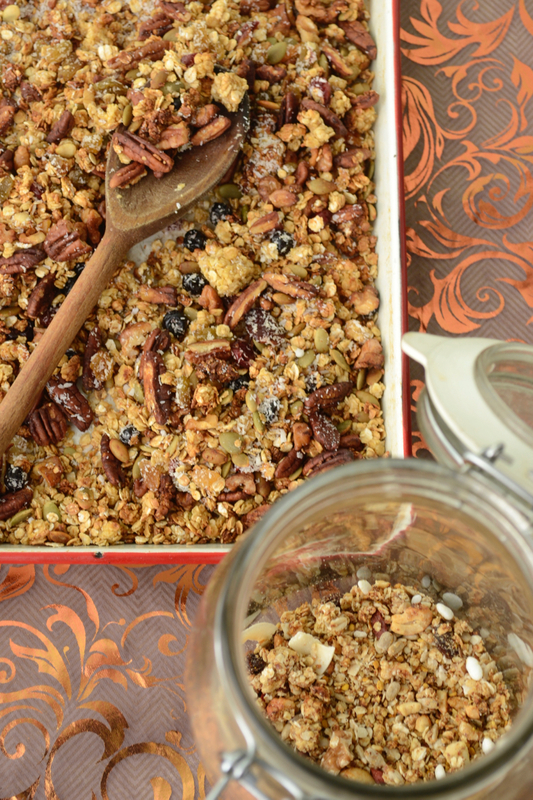 We’ve no idea how this healthy take on granola might have slipped through the net in our recipe repertoire, but never fear, it’s now live and online for you to try at home! We don’t use oil in our granola (how many recipes online stipulate glugging refined oils all over gorgeous oats and nuts? Horrible!) We also don’t use any added sugar. All you need is a little honey (please try find local, don’t buy imported!) and our secret trick of some orange juice! 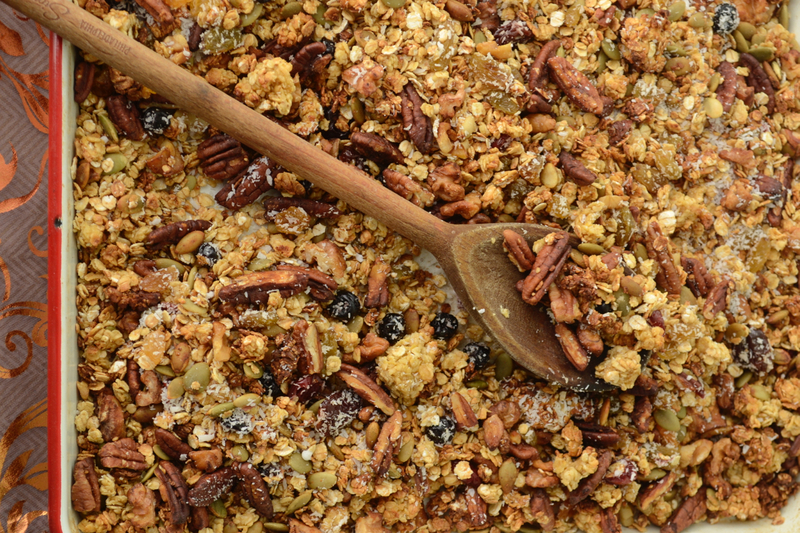 Yes this sweet, natural combination works wonders for granola, ensuring it’s beautifully golden-tinged, nicely clumped together and with just a hint of a sugar-y kick! We’ve reverted to the American system of measurement here simply for pure ease. No one wants to whip out the scales and measure to within a gram’s worth of oats, right? Same goes for raisins or tiny grains of coconut. Take it easy, this is fun cooking! Using the one cup (or set of cup measures) you can make this recipe really simply. 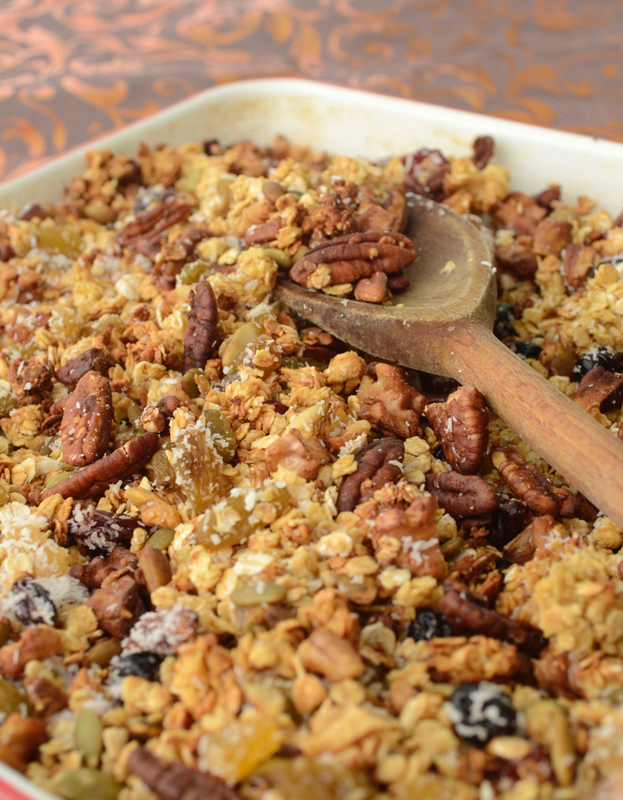 This will take under 45 minutes of your time and you’ll be blessed with granola for a good two weeks! Now that’s a good use of time, right? 1. 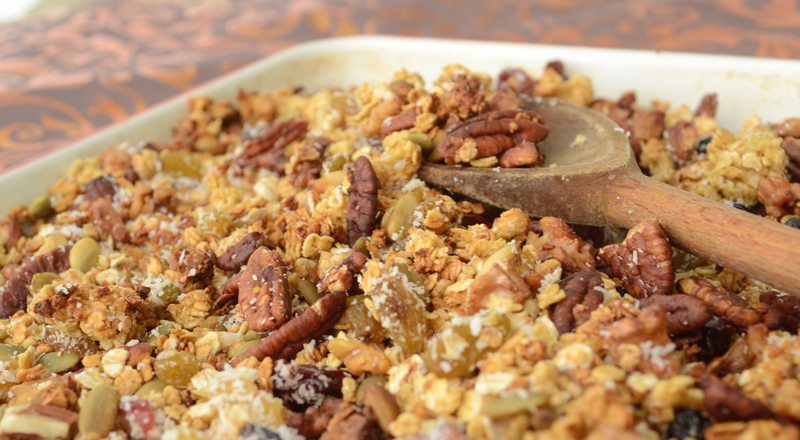 Pre-heat the oven to 180ºC whilst you chop the nuts as fine as you like –we usually half the pecans, quarter the walnut halves, chop the almonds into slivers; do it how you like them best. Add these to the seeds and oats in a large bowl. 3. Mix the orange juice and honey in a small ramekin and then pour over the oat, nut and seed mixture. If using coconut oil (which gives extra colour and flavour here), add this is in too. 4. Using clean hands, clump together the mixture in fistfuls to ensure the liquid slicks as much of the mix as possible. 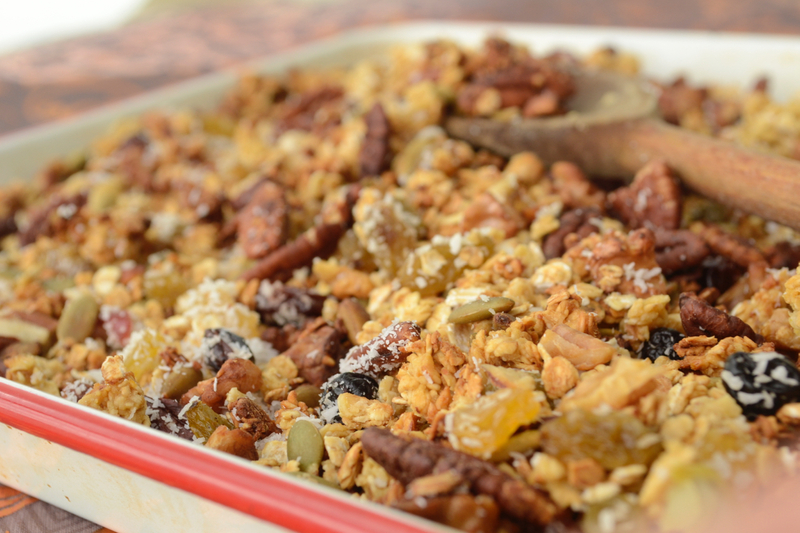 Keep doing this for about two minutes until you’re happy with your granola mix. 5. Decant onto a large baking tray and spread out into one thick layer, then pop in to the oven for about 30 minutes, but only put the timer on for 8 minutes at a time. After each 8 minute alarm, stir the mix with a wooden spoon to ensure even colouring and return to oven. 6. After 3-4 turns (at 24 and 32 minutes) you’ll find your granola has a nice golden colour. When happy, remove from the oven and allow to cool slightly. Add in your fruit and/or coconut and stir through well. 7. Fill your jar and enjoy! Like so many of GastroGays recipes, this is simply a blueprint. It’s a springboard to jump from. Tailor this recipe to your tastes. We’ve left out hazelnuts as Russell has a serious distaste of them, Patrick loves them. You could turn this chocolate orange by chucking in some cacao nibs and the zest of the orange you used at the end, even a sprinkle of really good cocoa powder if you like! We’ve sometimes put in lots of combinations of dried fruits (blueberries, cherries, goji berries, cranberries) for extra sweetness and chewiness whilst if using dried apricot, fig or date make sure to chop into small, bitesize chunks. Let us know in the comments below if you make this, and tweet us how you’ve interpreted or adapted the flavours or ingredients to suit your own palate!